Joseph Skillen ('93 M.M-tuba/euphonium) has been recognized as a recipient of the Lousiana State University (LSU) Distinguished Faculty Award. The award recognizes faculty campus-wide who show sustained records of accomplishment in research, teaching, and service. He serves the university as the Galante Endowed Professor of Tuba and Euphonium. In addition to teaching applied tuba and euphonium, Skillen coaches chamber music and performs with the Norem faculty brass quintet. He is in demand as a clinician and soloist as well as an active performer in both chamber music and orchestral ensembles. 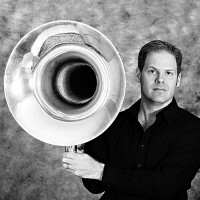 Prior to his engagement at LSU, Skillen was principal tubist in several American orchestras, and he has performed with touring ensembles across the United States, Europe and Russia. Additionally, he has presented solo performances on four continents. Some locations where Skillen has performed and/or taught include Brazil, Germany, Italy, Ireland, Japan, China, Sweden, Finland, Russia, and numerous locations throughout the United States. He has been a finalist and winner in both American and international solo competitions, including winning first prize at the prestigious 1997 Leonard Falcone International Euphonium and Tuba festival. As a Fulbright Scholar, Skillen studied in Stockholm, Sweden at the Kungliga Musikhögskolan with the renowned tubist Michael Lind. While in Sweden, Skillen performed frequently with the Royal Stockholm Philharmonic Orchestra. Other groups with whom Skillen has performed include the Kentuckiana Brass and Percussion Ensemble, the Galliard Brass Ensemble, Detroit Chamber Winds, Michigan Opera Theatre Orchestra, the Western Brass Quintet, and the Tennessee Tech Tuba Ensemble and Symphonia – an ensemble of the premiere artists and teachers in the United States. His performances have been broadcast on America’s National Public Radio and on Sweden’s National Radio. In recognition of his musical and research activities, Skillen was awarded the 2004 LSU Alumni Association Faculty Excellence Award. Other awards include a Louisiana Artist Fellowship from the state department and numerous research grants from the LSU Department of Graduate Studies and Research. He has also been recognized for his excellence in teaching when he was awarded the 2000 Tiger Athletic Foundation Teacher of the Year award for the College of Music and Dramatic Arts. His students are playing professionally, teaching music in universities and in the public schools, pursuing higher education, and have won international competitions. Skillen’s solo playing may be heard on the Mark, Bernel, Centaur, and Vestige labels. Recent ensemble recordings include The Kings of Brass and Tubalogy 601 (jazz) on Mark Records (both with the Tennessee Tech Alumni Tuba Ensemble). His debut solo CD with pianist Jan Grimes, Blue Plate Special, was released in January 2002 on Mark Masters Recordings. In addition to his teaching and performing schedule, Skillen is an associate editor of the ITEA Journal, the official journal of the International Tuba and Euphonium Association. His articles, reviews, and news columns have appeared in the International Trombone Association Journal (ITA Journal), the ITEA Journal, the TUBA Journal, and the Hokkaido, Japan Euphonium and Tuba Journal. Skillen is also an active arranger for solo tuba and the tuba/euphonium ensemble with his transcriptions and arrangements being published by the Tuba Euphonium Press and Bernel Music Publishers. His most recent major publication is the tuba and keyboard chapter in the reference book Guide to the Tuba Repertoire published by Indiana University Press in 2007. Currently, Skillen serves as secretary of the International Tuba and Euphonium Association. His election to this position, in addition to his numerous roles on international adjudication panels, presentations at International symposia, and international committee work continues to show the respect that Skillen has earned from his colleagues around the world. Skillen holds degrees in music education and performance from Tennessee Technological University, Pennsylvania State University, and Michigan State University. While at Penn State, he was a student of Mark L. Lusk. Prior faculty appointments include Murray State University, Western Michigan University, and the University of Michigan-Flint.